Programmes that teach children self-reliance and teamwork may have lifelong benefits for mental health, according to findings from the National Child Development Study (NCDS). Researchers from the Universities of Edinburgh and Glasgow examined information from more than 9,600 people born across England, Scotland and Wales in a single week in 1958 who are being followed by NCDS. At age 50, the study participants were asked a series of questions to assess their mental health. They were also asked if they had taken part in scouts or guides as children, and just over a quarter had. The researchers found that former scouts and guides were nearly a fifth less likely than other adults to suffer anxiety or mood disorders at the age of 50. The apparent benefits of scouts and guides remained even when taking into account other factors that might affect people’s mental health, such as social background and family history of mental illness. Other activities, such as church or voluntary groups, did not appear to offer the same protection for adult mental health. The authors believe that the benefits stem from the structured nature of scouts and guides activity, and the lessons they teach in resilience and resolve. 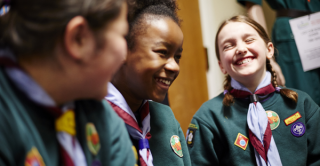 Prof Chris Dibben, the study’s lead author, said “It is quite startling that this benefit is found in people so many years after they have attended guides or scouts. Children from poorer backgrounds, who are at greater risk of developing mental illness, seemed to benefit most from joining scouts or guides. “Governments and health services around the world struggle to do something about the health gap between richer and poorer people, so this new evidence that being a Scout or Guide can help is very important,” said Richard Mitchell, another of the study’s authors. Be(ing) prepared: Guide and Scout participation, childhood social position and mental health at age 50—a prospective birth cohort study by Chris Dibben, Chris Playford and Richard Mitchell was published in November 2016 in the Journal of Epidemiology and Community Health.